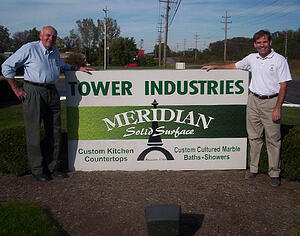 Founded by father-and-son team Bob and Todd Werstler, Tower Industries is the premier provider of creative surfacing solutions for a wide variety of commercial and institutional applications. We have worked tirelessly to build a business driven by hard work, top-quality surfacing products, innovative solutions, and continuous improvement. All Tower Industries products are custom-fabricated in our 60,000 square foot manufacturing facility located in Massillon, Ohio. We work regularly with architects, designers, contractors, and builders, offering open lines of communication, creative ideas, and responsive customer service. Our unrivaled flexibility, in both our business model and the design of our products, allows you to focus on other pressing business priorities. Tower Industries is committed to serving a wide range of clients, including commercial general contractors, millwork/casework suppliers, dealers, builders, specifiers, architects, and designers. We are dedicated to exceeding customer expectations and delivering absolute, on-time performance. Our team strives every day to save you time, enhance your satisfaction, and increase your profits. You can expect full collaboration, personal attention, and direct communication at every stage of your project from our responsive staff. With Tower Industries, you can rest assured that your project will be delivered on time and on-budget. We do what we say we are going to do, when we say we are going to do it, for the price we say we're going to do it for. We’re a world-class manufacturing company. What we’re good at today is delivering jobs on time, delivering whatever job the customer requires to their specifications, and delivering for whatever we agree to deliver it for. We really believe that we are an “A” supplier. We do what we say we are going to do; we can’t let people down. Our reputation as an “A” supplier allows us to have “A” customers. As long as we continue to deliver this philosophy in all of the channels were service, we will continue to be successful. If you’re here, we know you want to talk about solid surface showers, and maybe even some solid surface countertops to go with them. Please contact us to schedule a visit.